We started out in Tulsa in early May and almost thirty shows and performances later we finished up tonight at the Mohegan Sun Arena in Connecticut, Tuesday July 3rd 2018. 'Gloria' returns to the U2eiTour show for the 15th time and wins the final battle for 5th spot for leg 1 - here's the set list. 'I came here looking for American soul. I found some. Out here on sacred land on a Native American reservation. In a casino decorated with shining lights and signs and wonders, in a room with a few 'thousand other close friends and family'. Nothing should get in the way of the fan and the thing they are a fan of. Nothing here did. Nothing should get in the way of sharing some of the best times in your life with others who are fans of the same thing. Nothing did. Nothing stopped this from being the best day ever… I am aware that I have said that same thing pretty much every time I have been at a U2 show over the past 30-odd years, including, like many other fans this tour, after seeing the show in a number of cities in North America. What made this one special? Different? The setting. Weird. Like some kind of peyote-induced vision. Hard to reach. Fabulous. Intimate. Dangerous place for a compulsive gambler (we know that to lose is what we're here for, right?). I coped with that because more important things than winning a million bucks were here to tempt me. The hall inside the casino was like it was built to house the staging. Serendipity strikes again… Brilliant sound throughout the hall. Stunning visually. Breathtaking and mind expanding (no, did not partake in local cactus water). The mood. Last night of the tour… for a bit anyhow.. always is a bit special. Bono was chatty tonight, guards were let down a little… The whole band looked relaxed and on top form… smiles, poses, nods, gestures to each other and fans are all good signs we are having a special night. The set is set, pretty much, but loved loved loved the leg finishing up getting Gloria this time. That song stirs my soul. Every time. Other musical highlights for me were Desire (the singer really ripped into the lyric, fully aware of the casino setting, best version I have heard live of this for a good while), Acrobat (of course! ), and the pairing of American Soul & City Of Blinding Lights (incredible visuals and sounds, a real centrepiece of the last-but-one section of the whole show. Hats off to the band and whole crew on this… the tightness of the performance is a about as good as it gets. If I could thank Joe O'Herlihy and Willie Williams personally just for this bit I would… in fact… I did actually bump into Willie and did just that…. and also ask him, amongst other things, how all this would pan out into the European leg… On that he said he was really looking forward to it, and of course there would be a few changes.. but what they might be, well we all gonna have to wait and see. Exciting. Lastly, to wrap this I have to say alongside and equal to actually being at a U2 show while they are playing on stage, just as great is meeting fellow fans, some of them friends, some of them enemies… all important… all relevant. One thing unites us. Well maybe 2 things. One is this band. Literally. Secondly, at this mid-tour break-point, is a feeling… that we may be near the end of something. It's real, but you know what, that fear is not winning the day. I think we all agree the band deserve some kind of break after all this passes… however long that is. But for now, we are just glad, I think, that we got a least one more leg to look forward to later in the Summer. After everything this American Soul version of the #U2eiTour has offered up, this European soul will be, God-willing, ready for what's next. See you in Berlin, Bono, Edge, Adam, Larry and all the crew… happy 4th of July to you all. You. Are. Rock & Roll. 'What better way to celebrate American independence than with an Irish band on Native American sovereign ground. 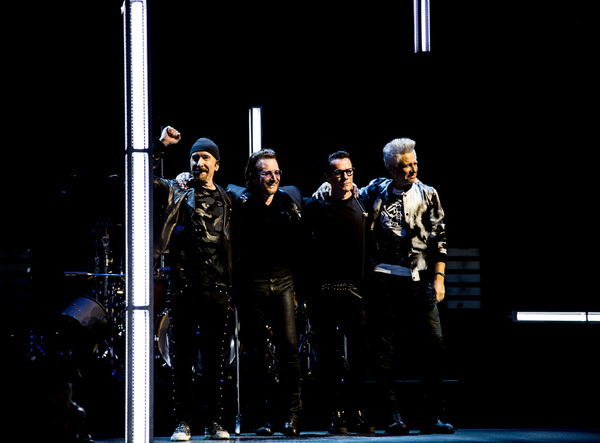 U2 closed out its North American "Songs of Experience + Innocence" tour with a two-hour performance at Mohegan Sun Arena on Tuesday night. Even with the little ironies of time and circumstance, the celebration made perfect sense. After all, Mohegan Sun continues to be one of the country's great live music venues, consistently pulling down industry accolades. It is no wonder that more and more star attractions are choosing to both start and / or end their tours there. And U2 may be the best American band available. These Dubliners are steeped in American culture, well-versed in American politics, and awash in American pride. Led by enigmatic frontman Bono, the rock quartet's performance was as immersive a concert experience as you will ever see. While the concert experience has become exhaustingly obvious, the U2 version is anything but. With a two-tiered hydraulic catwalk, blanketed in a floor-to-ceiling screen, stretching from one of the arena to the other, the audience was fully engaged. The performance wasn't something happening down one end of the hall. It was in front of you, behind you, and beside you. The set started out sweetly enough with "Love Is All We Have Left," and immediately swerved into garage rock with the bombastic "Blackout." The band was spread out on the catwalk in a sort of linear in-the-round set up before walking back to the main stage for a raw take on "I Will Follow." Bono explained the set list as the story of the band in song and took the crowd on a journey with biographical songs like "Iris," and "Cedarwood Road." The group made its way across the catwalk to a second stage to deliver "Sunday Bloody Sunday." The song segued purposely and perfectly with "The End of The World," as the band turned its wall-of-sound approach into a sonic war zone with Larry Mullen's snare sounding like shots fired, Edge's guitar work the whirring bullets overhead, and Adam Clayton's bass the echoing of distant artillery fire. The song ended with leaflets falling from the rafters that upon further inspection turned out to be torn pages from "Alice in Wonderland," and Dante's "Divine Comedy." Bono disappeared behind the screen for a moment and returned as his alter-ego "Mr. MacPhisto," the devilish character he first conjured up during the ZooTV Tour of the early 90s. He led the band through "Elevation," "Vertigo" (with a closing refrain of The Rolling Stones' "It's Only Rock 'n' Roll (But I Like It)." He called on the Stones again as a prelude to "Acrobat," his MacPhisto character soliloquizing through "Sympathy for the Devil" as his on-screen face morphed grotesquely into satanic form. "What a year it's been," Macphisto mused. "Lunatics on the left, lunatics on the right, and children in cages." Bono and Edge offered an acoustic take on "Staring at the Sun," while their cohorts manned stages at the side and back of the arena. When Edge moved to his own stage all four sides of the arena where in play as the band soared through "Pride (In The Name of Love.)" In what might be considered Bono's only overt political statement of the night (although he was stealthily subtle throughout), he cited "Wide Awake in America" the title of an early EP release. "It's never been more important to be wide awake in America than right now," he said. "The very idea of America is at stake." The band played "American Soul" in front of a colossal flag that stretched the width of the arena and closed the set with "City of Blinding Lights." The encore included "One," and "Song for Someone." @mackfisto (via Twitter) 'thinking back about how many incredible, unbelievable things happened for me and my friends this leg of the tour and hardly comprehending any of it. thank you, @u2, for all of it. #U2eiTour, you're one that'll never be topped'. @squintyt4e 'U2 Last night in Uncasville, CT wrapping up the NA leg of the #U2eiTour - utterly amazing and powerful! My 10th U2 show and just as visceral and powerful as the 1st in 2001'. If you were at the final show in New York, add your own photos and reviews here.